Ahoy thar mateys, ye should all know that today marked another Talk Like A Pirate Day. However, this year the captain missed the boat. Aye, I've been sailing around the five Western Seas (read: western US states) for many a fortnight now, and me head be full of seawater and deep sea creatures. Today I lost nautical sight of Talk Like A Pirate Day, only realizing its jolly return a few hours ago. But avast, not all be lost. Today I voyaged through the mythical treasure island of Disneyland, in pirate mouse ears, pirate shirt, and plenty of plunderin' pirattitude. What adventure did I join, might ye ask? The new and improved Pirates of the Caribbean ride, updated to include Jack Sparrow and other wicked treasures. Something in my salty blood was telling me it was Talk Like A Pirate day... my periscope's been sighting pirates all week. Tis a blessed this, this day. My review of the new Pirates ride... ten skulls. Ok, so I spent the last two days at Disneyland/California Adventure with Alice, and it's been fantastic. So much pirate gear. Oh my crap, it's a pirate paradise. The downside is that I did neglect this wonderful day on PirateJokes.net, which is too bad, since my traffic jumped 3,000% today. 70 new joke submissions, many of them new. Pirate heaven. 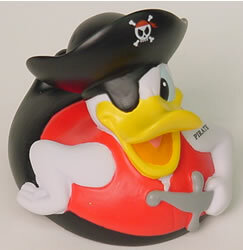 I'll post more about all my adventures relatively soon, but in the meantime check out the coolest souvenir in the whole scurvy-ridden dubloon shop: The Pirate Donald Bath Time Rubber Duckie! Also... observation: pirates call women wenches. Six Flags refers to them as Damsels. Disneyland refers to them as Pirate Princesses. Yet, in the Pirates of the Caribbean ride, there is a wench reference. That's piratical.